I’ve just received a mail apparently from a Smartbar member asking me to remove the Moodymann session due to authorization things, so, during my investigations, I remove the link. 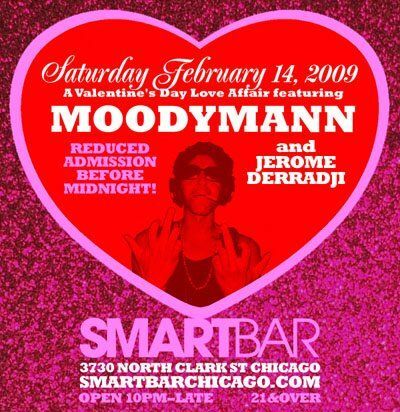 Here is a 6 hours session recorded at the Smartbar (Chicago) on the February 14′ for the Valentine’s Day Love Affair. Many thx for the tracklist. But does anyone know what the song is before Michael Jackson? Huge thanks for the tracklist! It doesn’t mean its fake! I just means the track list is incorrect!!!! The track list is correct, but the timings are wrong. Remember this is a 6 hour set and the tracklisting only covers 2 hours of it. Brothers why can not I download this mixes??? @Jamiejamie : I’ve received a mail apparently from a Smartbar member asking me to remove the Moodymann session due to authorization stuff. I think that you can still find this session on Google.